Unique and engaging, this wine is earthy cinnamon red in color, like the underbrush. Briar. Slight essence of sherry gives way to juicy, refreshing wild berries on the nose. This continues on the palate with undertone of pure bing cherry. Notes of blackberry, red and black currant are tart and wild sweet. Spicy herbaceousness is present, with ubersoft, smooth mouthfeel and tannins that offer an ultimately dry finish. I love this style wine and found it absolutely delightful, with much finesse, even restraint. After some breathing time, depth and sensuality. One could also imagine enjoying it with a slight chill on, in warmer sunnier climes that is ... such as, of course GREECE! $14.99 at Rosemont Market, Portland. Thymiopoulos Vineyards are located in northern Greece - Macedonia, specifically at Trilofos and Fytia, the southern tip of the appellation of Naoussa. The Thymiopoulos family has owned their 200 acre vineyard for several generations and formerly grew vines to sell to co-ops. Apostolos studied oenology at the University of Athens and since then has been producing wine for his own label. For the "Young Vines" bottling he used 5-7 year old newly replanted vines to maintain his high quality standards. Where terroir is concerned, Naoussa has soil rich in clay and also calcium and limestone. Vines are farmed biodynamically in this also rich agricultural area. Fermentation is with wild yeast and the juice sees no oak. Indeed, his distinct and innovative Xinomavro wines have created international waves. Speaking of the grape itself, the Xinomavro varietal is perhaps idiosyncratic to say the least. Grown in various parts of Greece, particularly the north, it is highly regarded as Greece's finest red and known for its high tannin, acidity and deep red color. The grape's name means bitter (Xino) black (mavro) - as Negroamara is for Italy. It's the primary grape in the areas of Naoussa and Goumenissa. 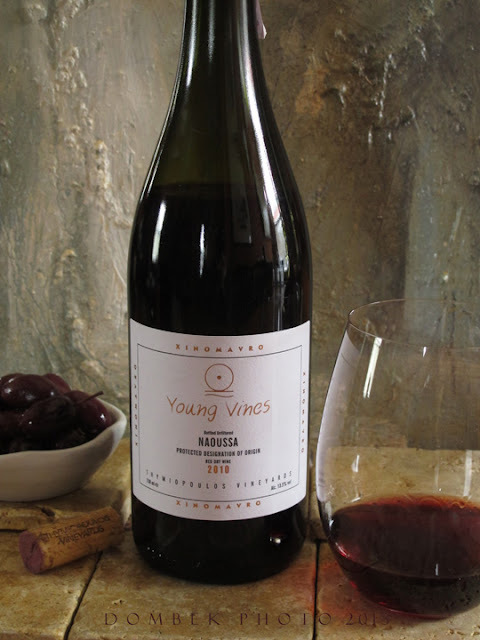 And in the inspired hands of Apostolos Thymiopoulos, it becomes wine for those "in the know" and enjoyed by Greece's hip wine drinking circles. I look forward to tasting the "Uranos" as well (another from Thymiopoulos Vineyards), should it become available here, which reportedly has the depth and characteristics of a powerful modern style Barolo. Yes please! This wine is brought to us by SoPo Wine Co., South Portland, ME and Athenee Importers, NY (the largest importer of fine wine, spirits and beer from Greece and Cyprus). Available at the following retailers: Rosemont Markets, Browne Trading Co. & RSVP, Portland; Lakonia in Saco; Perkins & Perkins in Ogunquit. Also find it on the wine list at Street & Co. and Eventide Restaurants, Portland.